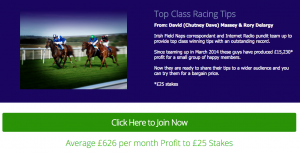 The Racing Consultants shares the combined expertise of Rory Delargy and David Massey. Rory is the Naps correspondent for the Irish Field and featured on RTE for the Cheltenham Festival. David is on the tipster panel at Southwell and is a regular on Will Hill radio. They team up each morning to discuss the days racing and share their insights along with high priced tips for the days cards.